Everything looks good with its complimentary part, bride with its groom, flower with its fragrance, sun with the beams, birds with their chirp, clouds with raindrops and rainbow with its hues. Any counterpart lacking in them would make them meaningless. Likewise is the case with all animate and inanimate objects. Some things are so indispensable that we can’t do without them; however they can be abstract and totally random.In the world of design and art, we know beauty is all that matters. How can we think of packaging designs without beauty and spark? Designers have to seek innovation and creativity because whenever they are sitting at their desks looking at their regular bigger and smaller tasks, all they need there is active thinking capability that can not only generate ideas, but also give them sequential base and implementation in the long run. What it takes to be an awesome designer? It has a lot to deal with motivation and stimulation of innate think-tank. This is the job of a designer he has to pinpoint the elements that should be in the main focus. When we talk about packaging design of an eatable it has to be mouthwatering, appetizing and tantalizing to give a nice taste to the hungry bellies and the taste buds. 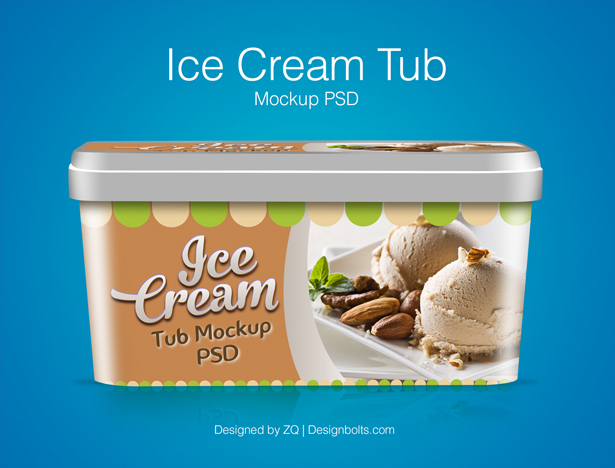 Today I am unfolding before you free ice cream tub packaging design template & Mockup PSD File. Have a look at it. You can use it freely without any intrusion or obstruction, insert in your own design in the mockup or you can pick up any element from this template, to use it in your own formation of the ice cream packaging design. Stick around more freebie, we are here to please your interests. You can also look back to the free mockups I made recently, they will for sure give you a good turn, a shoulder to lean on or a helping hand for your projects. 2. Layers are hidden to decrease the size of file kindly unhide, ungroup and place your design.